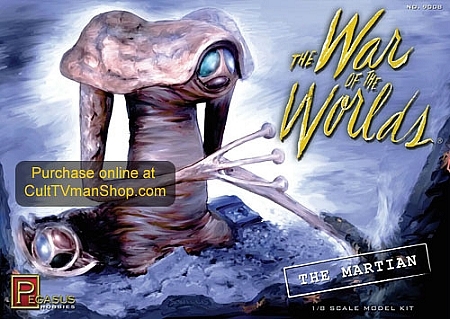 War of the Worlds Martian is a new figure from Pegasus Hobbies. This 1:8s scale figure comes with 2 sets of arms for different poses. 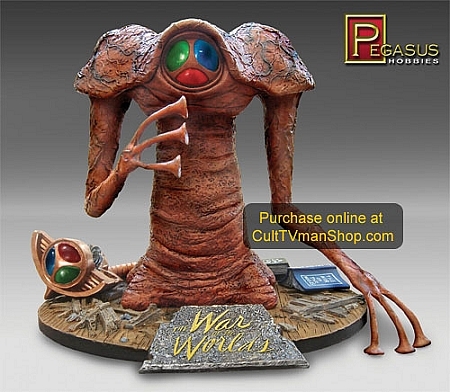 The figure is injected vinyl with a plastic base. The eyes and lenses are clear plastic for lighting. This was the first basically vinyl kit I ever built. From that it was easy but be careful of the primer you use. The creature was vinyl and the base was plastic with a couple of vinyl parts. Pegasus did a great job recreating the 1953 martian and the kit and base capture the movie well. I have been impressed with Pegasus's kits and this one is good example of them producing a nicely priced and unique product.